The Koenig Road Runner was a reworked version of the Porsche 930, it’s flat six was enlarged to 3.4 liters, and a larger turbocharger was fitted to the embiggened engine. Power output was anywhere from 480bhp to 550bhp. 0-60 arrived in 4.4 seconds, with a top speed of 191 mph. 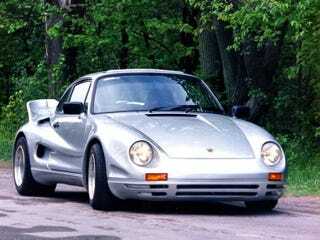 It had a new nose with Porsche 928 headlights mounted lower than the stock units, new side panels were fitted, along with a big wing and massive air intakes. Audi 200 tailights replaced the stock units. A cabriolet was also available.